Vote for the Kootenai Cupcake. As most of you know, Tamara Lee was state campaign administrator for my Congressional race. The reason that I was so happy to have her on my team is that she is one of the best field and volunteer organizers in Idaho. When I got out of my race, it was only natural for her to jump into one of her own. And her skill and talents are being put to good use. For example, Tamara has just finished knocking on 7,000 doors in her district. SEVEN THOUSAND DOORS! That's incredible. She has run out of the 300 yard signs she ordered and has made so many phone calls that she has lost count. All politics is local and it is this kind of organization and effort that will advance the Democratic cause in our state more than anything else. Watch this race closely on election night because Tamara is working hard to win. And, the NIC students have even given her a nickname: the Kootenai Cupcake. I'm thinking the country better get to know Idaho's first congressional district pretty soon - as in before swearing-in in 09 - while we still have Sali to kick around. Meet Henry, my 1938 Ford pickup. As you can tell, Henry is a big supporter of our District 9 Legislative candidates. Jennifer Morgan is running against Judy Boyle, Judge Wayne Fuller is taking on Monty Pearce, and Fritz Hallberg is on the ballot opposite Speaker Lawrence Denney. We all know there are tough races but these are three of the toughest, so Henry is especially proud of Jennifer, Wayne and Fritz for stepping up to the plate in a hard district like District 9 which covers Payette, Weiser and Adams counties. Jennifer Morgan gets special accolades. She has knocked on more doors, made more phone calls, and handed out more literature than any candidate ever in our part of the state. Go Jennifer!!! Kudos also go to our local county organizations for filling all three slots on the ballot with candidates who are working hard to win. It is this kind of local organization and cooperation that will hasten the change we are all looking for in Idaho. Henry would also like you to know that even though he was manufactured in 1938 he is still two years younger than John McCain. And, of course, Henry gives a big wink to Pirate Jill. Bill Sali campaign slogan contest! And to think Drinking Liberally didn't think of this first. Sorry, people, we let you down. The Idaho Statesman, in its endorsement of Mike Simpson, stated that it was time to stop judging candidates based on how many earmarks they can bring home. It proceeds to make their decision based largely on those grounds. It's true that Simpson is out of step with Idaho conservatives, who value personal privacy and constitutional protections that Mike Simpson voted to violate through his support for the Patriot Act and warrantless wiretapping. It's true that he's voted against almost every renewable energy bill, despite the fact that they would have brought jobs to Idaho. And it is true that Congressman Simpson has passed only one sponsored bill in his decade on Capitol Hill. But he is good at one thing: getting earmarks for Idaho. He sits on the House Appropriations Committee, and because of this, a lot of money flows into Idaho. What the Statesman doesn't seem to understand is that, as a member of the majority party, I'll be in a position to get better results for Idaho. Democrats from conservative districts, in Idaho and elsewhere, are able to get funding for essential projects in their states. We've put all our eggs in the Republican basket, which is why we are one of the least influential states in Congress today. I can change that. I'll write legislation that is good for Idaho, and I'll actually be able to get it passed. Mike Simpson has passed only one piece of legislation in ten years. His CIEDRA bill, touted as the highlight of his career, has been in the works for more than nine years, and he's never been able to get it onto the floor of the House. Why? Because he couldn't effectively compromise in Congress, either with a Republican or a Democratic majority. He isn't the advocate Idaho needs. I'm not a "token" candidate, I'm a citizen candidate. 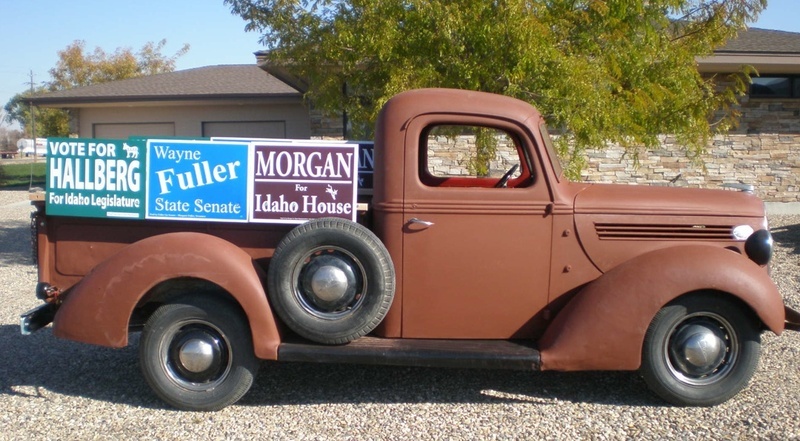 I've traveled the entire district, from Boise to Salmon to Driggs and everywhere in between; there's over 10,000 miles on my 1999 Ford Mercury from meeting voters. And if I'm elected, I'll work to make healthcare affordable for every American. I'll work to create intelligent oversight programs, so we never need another bailout again. And I'll push for real reform of the failed No Child Left Behind program, not just throw money at the problem. I can fund Idaho's infrastructure from Congress as well as Simpson, and I'll also push for necessary reform that he hasn't in his decade in Congress. Get out there and help -- TODAY! We're in the final four or five minutes of the last quarter of the biggest game of our lives, and we're right there. We are right there. That's why I'm writing today. If you're reading this, you need to pick up the phone and call the Idaho Victory Campaign. Tell them you want to come in -- TODAY -- for a shift on the phone, to help around the office or to drop literature during a canvass. We can win this. WE CAN WIN THIS. But we can't win it if you don't sign up to help. Turn off your computer, call one of these numbers below, and tell them that you want to contact your local office or campaign to volunteer. Walt Minnick has a new spot on television, telling voters that Bill Sali hasn't gotten the job done, but that Walt "will, every day." The ad comes as a new, independent poll shows a lead for Walt and as groups like the Meridian Chamber are throwing him their support. But we can't rest. It will take 12 more days of hard work to elect a Congressman who will work hard for Idaho. Click here to volunteer. I'm beginning to think I should make my campaign slogan "I Show Up." A couple of weeks ago -- as though they'd sprouted like mushrooms in all the rain we had -- campaign signs for my opponent started popping up everywhere. Every intersection, the middle of every block. I must have counted 50 of them on the way to the Southwest Ada Neighborhood Association Candidate Forum last week. What I didn't see there, though, was my opponent. In fact, my opponent was the *only* candidate in District 21 -- including the county commissioner races -- who didn't show up. Even Representative John Vander Woude, who lost to my opponent in the May primary, was there with his lovely wife. But I spent the whole evening sitting next to an empty chair, with a nice big nameplate on it, since he'd told organizers he'd be there. I had a great time listening to the good people on the eastern side of my district talk about their concerns with annexation -- a situation I face myself -- and I'm told they were impressed by me, too. I'm sorry, for his sake, that my opponent didn't recognize this opportunity for what it was. I'd like to think that the people in my district require more from their candidates than just sticking up a lot of signs.